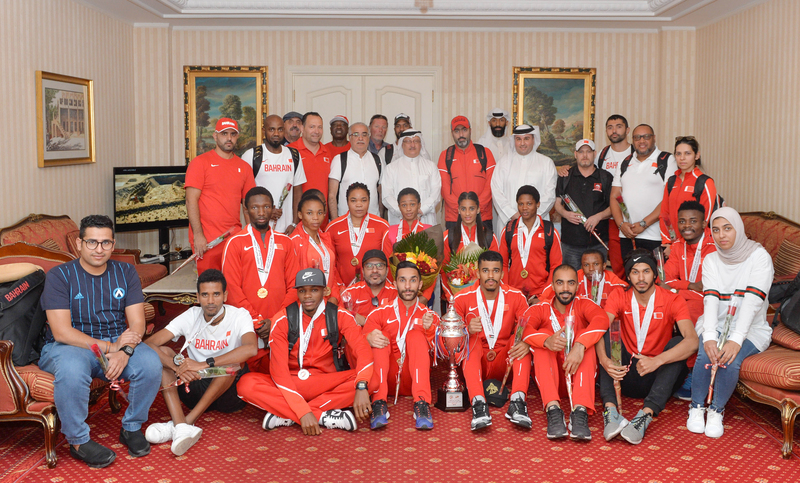 Members of Bahrain’s athletics team returned to heroes’ welcome after they were crowned overall champions at the third West Asian Athletics Championships in Amman. The kingdom’s national team brought their overall medal tally from four days of action to a staggering 35, including 20 gold medals, 12 silver medals and three bronze medals. Supreme Council for Youth and Sports assistant secretary general and Bahrain Olympic Committee (BOC) secretary general Abdulrahman Askar led high-ranking sports officials to welcome the team on return from the Jordanian capital. The delegation was headed by Rashid Al Buainain and included Bahrain Athletics Association (BAA) director Yousif Abdulqader and 36 athletes. Askar congratulated the team on this outstanding achievement, which underlines the hard work of the association and its president Shaikh Khalid bin Hamad Al Khalifa. On his part, Al Buainain extended his gratitude to the BOC and Askar for its support to all sports federations, and asserted the BAA aspirations to achieve better results on the international level. Some of Bahrain’s finest athletes competed in the various disciplines of the championships as they utilised the competition to help prepare themselves for the upcoming 18th Asian Games taking place next month in Indonesia. They were one of 12 nations competing in Amman. The others were Kuwait, the UAE, Qatar, Palestine, Lebanon, Yemen, Syria, Iraq, Iran, Oman and hosts Jordan. Hosts Jordan were second overall with 38 medals including 10 gold, and Kuwait were third with 12 medals, eight of which were gold.